The GMCF-21 21G15A is supplied in either a leaded (UM-1 or UM-5 style) package, or a jacketed (UM-1J or UM-5J) package. UM-1 or UM-5 style packaged products are supplied in boxes or bags. UM-1J or UM-5J style packaged products are supplied on tape and reel. 300 pcs per reel is the standard T&R pack sizes for these products. Partial quantities may be supplied on tape (no reel), or in bulk. 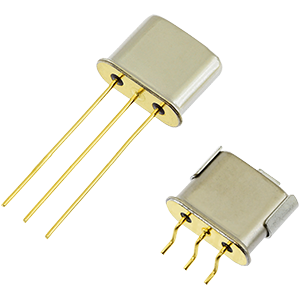 The GMCF-21 21G15A 2 pole crystal filter from Golledge with centre frequency of 21.4MHz features a 15kHz 3dB bandwidth and is available in multiple packages, including both UM-1 and UM-5 style leaded packages and UM-1J and UM-5J surface mount packages. This filter also features insertion loss of just 1.5dB dB. Find full specifications here. To request a quotation for the GMCF-21 21G15A please use the configurable options form to choose the options you require and then submit your configured product to our team. Our expert advisers are always happy to help with your requirements and can be contacted on +44 1460 256 100 or at sales@golledge.com.